Dress cut styling with sewn in bottom for maximum coverage. Thick straps for added support and long lasting comfort. Moderate leg height helps lengthen your legs, while still remaining conservative. 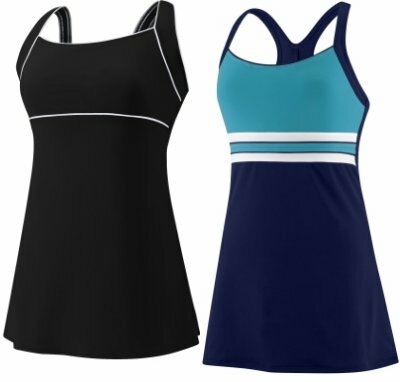 SpeedoÂ® Endurance+ fabric retains color 20 times longer than ordinary spandex. SpeedoÂ® Endurance+ is 100% chlorine resistant fabric that lasts 20 times longer than spandex. SpeedoÂ® Endurance+ features 4-way stretch technology for a comfortable fit. SpeedoÂ® Endurance+ features exclusive 9 Thread Flatlock Technology for a better fit. Soft cups provide support and extra shaping. Speedo's Solid Lycra Super Pro Back Suit delivers renowned classic Speedo styling and performance. With flat-locked stitching to eliminate chafing, low drag profile, fully front lined, non-slip straps, makes this one comfortable bathing suit for all water sports. Whether you're just hanging around the pool, swimming laps, or wearing under your exposure suit when going scuba diving, this 74% Nylon 26% Xtra Life Lycra Spandex Suit will feel comfortable along with being durable with its bar tack reinforced stress points and superior chlorine resistance.